Most of us have been there: butterflies in the stomach, clammy hands that tremble, difficulty breathing. Test anxiety is all too familiar to most of us. A recent article in The New York Times by Po Bronson and Ashley Merryman (also authors of Top Dog: The Science of Winning and Losing) explores why some kids (Warriors) seem to approach exams with cavalier nonchalance while others (Worriers) are seized with paralyzing stress. Of course, human behavior is influenced by a multitude of factors, but there’s also a compelling genetic explanation for this phenomenon. When a person experiences stress, the prefrontal cortex of his/her brain is flooded with the chemical dopamine. Because our brains work best when dopamine levels are controlled, the gene responsible for clearing that dopamine, a gene called the COMT gene, sets to work to restore balance. COMT, however, comes in two varieties. The first clears the dopamine slowly. The second clears it rapidly. Those who have the rapid removal version of COMT, Warriors, tend to perform better under stress. Worriers on the other hand, whose brains seem to become saturated with dopamine, often experience a drop in performance. Here’s the part that makes this seem particularly unfair to Worriers: A slow-acting COMT gene is typically associated with higher cognitive and executive function skills. So students with higher cognitive abilities who sit down to a test are at a larger disadvantage than their less academically able classmates. The Times articles notes that a study in Taiwan demonstrated that students with higher IQs coupled with the slow-removal gene under-performed their fast-acting COMT-endowed counterparts on a high-stakes national exam. This seems like bad news for Worriers, but, happily, there is hope. Studies of stress indicate that, like much else in life, the spin we put on a situation has an enormous impact on the way we deal with it. According to the authors, both amateur and professional athletes have been found to experience the same levels of stress before competition. The difference? The amateurs view stress as a derailing force while the professionals view it as an energizing one. The article notes that a study at Harvard put this principle to the test in an academic setting. Before taking a practice test, some students were given a statement explaining to them that stress actually improved test performance. Not only did that group out-perform the control group on the practice test, but they attained higher scores again when they took the actual GRE weeks later. Allow the student to verbalize what she is feeling and help her by giving her the right language if she struggles. If talking it out is too hard, ask her to write about her thoughts. Help the student to understand that stress is not only normal but potentially beneficial. Share with him the story about stress experienced by amateur and professional athletes. Talk about viewing stress as a positive phenomenon. Physical relaxation can sometimes trigger mental clarity. Help students learn self-coaching language, or teach them to tense, then relax, various muscle groups. Some students may feel better if they have the chance to engage in physical activity before a test, like doing some yoga poses or going for a jog. Familiarity with test-day factors can be enormously helpful in combating stress. 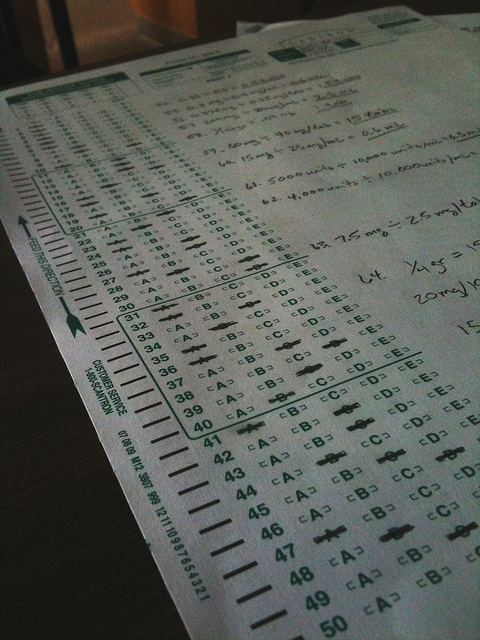 Help your student take practice tests, ideally under the same conditions in which she will face the real thing (i.e. setting, time constraints, etc.) If all that isn’t possible, visit the test site, review the testing procedures with your student using the verbatim instructions if you can find them, etc. Scholastic competitions (the math team, spelling bees, etc.) can serve as what the authors call “inoculation” for Worriers. Encourage your student to participate in such activities.